This magnificent hotel is fully prepared to provide the best service to its customers, has four swimming pools (one with a swim-up bar), Jacuzzi, gym, sauna and a wellness center "Renova Spa" with different treatments and massages. Everything you need for maximum comfort during your stay. Being on a privileged environment, the hotel offers a variety of activities on the beautiful beaches such as diving or fishing in the Pacific waters, ecotourism in the volcanic areas, and during the day several programs of entertainment for all ages, whether in family or friends. 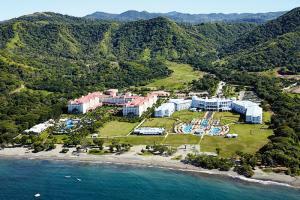 Located in Guanacaste, Costa Rica at the edge of the beach of Matapalo.